Many, including myself, have written persistently and widely about the extensiveness, and the causalities, of the impoverishment of far too many First Nations people in the world’s second wealthiest nation (per capita) – of the horrific homelessness, incarceration, ill-health and suicide rates. Recently, some of us have been able to garner Government responses to for instance the abominable suicides crises, and now something is being done about this – thanks predominately to Senator Nigel Scullion – through the guidance of Aboriginal and Torres Strait Islander experts in the field and with the coalface community driven program leaders. But what about the holistic landscape for First Nations peoples? Australia’s racism-born poverty, its consequences – the myriad ill-health, its impacts on historical, cultural and contemporary identities? What will it take to end the divides between a stream of cruel impoverishment in an otherwise ocean of unbelievable wealth? It does not wash, not even with a single imagining, that it should take generations to sort this out, not when the third-world-akin poverty affects less than one per cent of this continent’s total population. It does not wash, not by any stretch of the imagination that this nation does not have the capacity, does not have the means to end once and for all the divides. What this nation may have is the lack of the strength of character to do so. Sovereignty, in all its meanings, if afforded exclusively to First Nations people across this nation can end the disparities and enrich and empower peoples but this will not happen any time soon. It is reasonable to believe that the Commonwealth of Australia will not relinquish territories and especially while they are soaked in resources that mining companies drool over. These resources in the hands of the true custodians of the land could relieve the impoverishment. But there remain outsiders dogged in the fight for the lands they eye over. The peoples of lands who are yet disconnected from their ‘sovereign’ homes for want of a better word in new born titles from this two century old invasion remain the salt of the earth of their lands – many with connections unbroken, the custodians in respect of their communities and wider environments. They are the great hope for an ongoing and continuing diverse Australia rather than a homogenous Australia. They are the great hope of an Australian and First Nations cosmopolitanism and spiritualism that racism has fought and is still fighting an ugly battle to deny. But Native Title has failed. In the two decades since Native Title some have become wealthy, assimilated and divisive but for the majority who remain true to their lands, they have been neglected, mistreated and impoverished. The Native Title industry has made wealthy the coteries of native title lawyers and practitioners who rapaciously feed out of a trough that they should never have been allowed to have their snout sink into. Then there are the filthy carpetbaggers I have written all too oft about, who clean up the rest of the trough, their necks straining deep into the trough – those predominately non-Aboriginal leeches and buzzards who prey in and around Aboriginal corporations. No more need be written about these scumbags. Native Title land rights cannot work to any plausible objective where there shall arise a holistic social dividend when people are denied exclusive rights to their lands. To have anything less than exclusive right to the land is cruel theatre. Governments – Commonwealth and State and Territory – have nothing more than assimilation on offer. But the impacts of assimilation, and especially on those whose settings are still as First Nations people, are horrific. There are clashes of cultural settings, of western settings and First Peoples settings, and we have seen them the world over, not just here within this vast continent. We have seen the impacts – the murderous fallout in the attempt to erase historical and cultural identities instead of allowing for the unfolding of identity, for the coalescing of people. We have seen the induced homelessness, the manifest of slummy townships, dustbowls. These corrals come with the imposed departure from how people choose to want to be and in how and why they wish to live their lives. Hence there arise dysfunction, sadness and suicides. Some never give up in fighting for the reclamation of their Country, for their languages, for their historical identity, for happier times. This says it all. The death of culture is the death of a nation. A nation stays alive when its culture stays alive. According to the Australian Institute of Health and Welfare (AIHW) the rate of homelessness for First Nations people is four times the rate (191 per 10,000) of homelessness for non-Aboriginal Australians (49 per 10,000). According to the AIHW, First Nations people are more likely to sleep rough – 27 per cent of all First Nations homeless persons compared to 15 per cent of non-Aboriginal homeless persons. 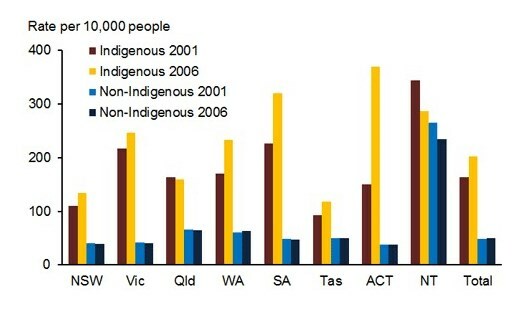 According to the AIHW, First Nations homelessness is increasing while non-Aboriginal homeless rates have steadied. Therefore, in reference to homelessness the divide is not closing, it is widening. According to the Australian Council of Social Services (ACOSS), First Nations people and communities are doing it as tough as they ever have in terms of poverty and disadvantage. Median incomes of First Nations households are just 65 per cent of those of non-Aboriginal households. And despite assimilation being pushed, instead of integration, employment rates are lower in all age groups in every State and Territory for First Nations people. According to OXFAM Australia, poverty is as real on this continent as it is in any developing country. But Australia is the world’s 12th largest economy, the second wealthiest nation per capita, it has the world’s highest median wages. But Australia, in what should be to its most shameful embarrassment, also allows for a stream of dire poverty, third-world-akin. First Nations people are a predominately young population with a median age of 20.5 years compared to 36.1 years for the non-Aboriginal population. Nearly all of today’s First Nations people have been born since the 1962 right to vote and since the 1967 referendum on the right to be included in the Census. The majority of today’s First Nations persons were born after Aboriginal Tent Embassy, after the great land rights marches of the 1970s and 1980s, and after the 1992 Mabo decision in the High Court. So why then is the collective lot of First Nations people worse than ever before? They should be living with the fruits of the legislative changes, with the fruits of the great struggles, but instead they are being incarcerated at among the world’s highest rates, living poorer than ever before, many as if they are Stateless, and suiciding at among the world’s highest rates. In the Northern Territory, 98 per cent of the juvenile detention population is comprised of First Nations youth. We were not put on this Earth to betray our children. We were not put on this Earth to bury our children. The world’s second wealthiest nation allows for its First Nations people to die decades prematurely than the rest of the population. The world’s second wealthiest nation induced and then effectively has perpetuated high levels of chronic illnesses, preventable diseases, mental and physical disabilities among First Nations peoples. Till the (Professor Ronald) Henderson Inquiry in the early 1970s, First Nations poverty was not included in Australian Government data. They were not the forgotten peoples, they were oppressed peoples by our Governments. Rogues, such as the late doctor Archie Kalokerinos, dedicated their lives among remote communities to highlight and address illnesses such as glaucoma that the Australian health system did not want to know about. The Fred Hollows Foundation followed in his footsteps. It took rogues to start making a difference. Governments, made up of hundreds of parliamentarians and thousands of bureaucrats, lagged – abysmally and abominably. In the last twenty years, statistics have been pulled together on First Nations poverty and they evidenced a sorry tale. But today, we also need to be careful in pretending that much has got better because some statistics do lie. Because of so many, who have never lived disadvantaged despite being disenfranchised from their historical identities, suddenly being identified as First Nations people, this collectivised data disguises the extensiveness of poverty, chronic illnesses, life expectancy medians, premature death rates, suicides for those whose families have lived one or two centuries of impoverishment and oppression. Where data is disaggregated it generally demonstrates much has got worse for people in the remote and for those whose families have lived in disadvantage. Closing the Gap is a lie. I evidenced this last year. And the bigger lie of a $26 billion per annum disadvantage spending on First Nations peoples and communities is just that – a lie. I evidenced this last year and thankfully the Commonwealth Government confirmed this. Surprisingly, far too few researchers have looked at finding out how First Nations poverty has changed since say 1970. There should be much more exploration of this especially in light of one Government after another pushing for assimilation. However it would be fair to comment that most studies that have engaged with First Nations poverty post the 1970s assimilationist bent demonstrate that there has been little improvement in reducing ‘unemployment’ and there has been negligible improvement s with ‘low-income’ households. The intrusion of assimilation as a potential way forward will only continue to destroy First Nations people. After decades of assimilation policies, assimilation is a proved failure. It is evidenced by the suicides, by the premature death rates, by the incarceration rates, by the unhappiness. If Professor Henderson was still alive today he would be disturbed by the ongoing and worsening disadvantage and poverty of First Nations people that he first identified, in terms of its extensiveness, in the 1970s. The late Professor Henderson believed that his awareness-raising of First Nations poverty would make the vital difference. But alas, the abyss of despair remains and its catacombs of dark tumults are dungeons to the children of First Nations people. According to the Fred Hollows Foundation, First Nations people continue on with the high unemployment levels, high underemployment levels, endure overcrowded housing, their children are less likely to continue their education, and with chronic diseases that other Australians do not endure. The Foundation works with local communities to improve not only eye health but nutrition, aural health, women’s health, workforce training and community engagement. The late Dr Hollows first visited the Northern Territory in 1968. Still today, First Nations persons are 6 times more likely to be blind than non-Aboriginal Australians and 12 times more likely to be blind from cataract. There is a long way to go. According to OXFAM Australia, the health gap continues largely “as a result of decades of Government inaction and a continuing lack of appropriate medical services.” A 2007 report by the Australian Medical Association uncovered evidence of inherent discrimination in our health system. According to OXFAM and the AMA report, First Nations persons do not benefit from mainstream health services to the same extent as the rest of the non-Aboriginal population. All the funding needed must not be denied or delayed. Instant and unmet needs must be wiped out, ending the divides. 100 per cent of funds must reach communities, hitting the ground and not the already deep pockets of outsiders. None of any funding must be stolen by carpetbaggers nor misspent on outsiders who come in on unjustifiable consultancy fees and remuneration packages. With the right level of funding the divide ends in a decade, not just within a generation. The second wealthiest nation on this planet can afford this – dead easy. It can at long last redress the basic rights of its poorest 100,000 people. The Australian Medical Association estimates that half a billion dollars is needed annually to secure for First Nations people the same levels non-Aboriginal Australia enjoys of basic primary and secondary healthcare. Even if a billion or two billion dollars are needed each year for however long then this is the must-do. Anything less is not just unjust and inequality, anything less is a lie. Nothing should stand in the way of languages reclamation, identity reclamation, bona fide bilingualism. Nothing should stand in the way of schools being taught in their regional first language. Everything possible should be done to assist in all of this. Nothing should get in the way of cultural identity and its practice. This is a must do. This continent and its unfolding collective identity can only be enriched by this. This business of ‘consultation’ that supposedly takes place with Firsts Nations people should be redefined. It is not too late for recalcitrant Governments. We should not pretend consultation and impose on others. We must not be arrogant to presume that our will shall be the way and that we will ‘consult’ those who will be victim to this will of ours as to what will be only their pending victimisation. Instead of consultation let people be free in their own lands and communities and let them guide the way, their way – let us meet each other civilly and welcomingly, with no imposts. Let the north-east Arnhem define its identity and future. Let this be the manner of our way wherever possible on this continent, especially where western settings are still tenuous and young enough to be pulled into line. Allow the dominant demographical populations to do their own thing. These are some of the vital solutions. The Australian Government Department of Health knows all too well the consequences where we have disregarded people’s right to identity – historical, cultural and contemporary. They know all too well the impacts of hard as nails assimilation. “Reducing suicide and suicidal behaviour among Aboriginal and Torres Strait Islander peoples is now a public health priority for all Australian Governments.” Reducing suicidal behaviour will be ongoing work as long as impoverishment, disadvantage, inequality are allowed to languish. According to the ABS, data for the period 2001-2010 shows the overall (all ages) rate of suicide for First Nations people at 1 in 24 of all deaths – 100 suicides per year. My own recent research has it now at 130 suicides per year. Furthermore my research describes underreporting of suicides and that in fact they could be as high as 1 in 12 of all deaths per annum. One in 54 of all First Nations adults are in prison today. One in 24 of all First Nations persons has been to prison or juvenile detention. We need a different Australia, to change it from the one where suicide is born of inhumanity, where inequality is born of racism. We need to change Australia from the Australia where we betray our children and where we betray what should have been their hopes. We need to be solid-in-our-thinking that the ways thus far have not worked and therefore do not work at all. We must be solid-in-our-thinking that we can end disadvantage in ten years alone, starting from now. We must be solid-in-our-thinking that this is what we must achieve, that securing adequate funds is a must-do, that true land rights are possible, and that the right to identity and self-determination are also intertwined in land rights. We must strive in such ways as if it is possible to achieve these goals and settle for nothing less, for settling for less is settling for poor quality of life, for premature death, for the burying of our children. We must leave the people of their lands to enrich the diversity of this continent. Let us leave for instance the north-east Arnhem to the people of the north-east Arnhem. The more of these ‘Countries’ born not of Treaties but born of themselves out of their lands, and likewise born by the graceful departure of Commonwealth and State and Territory Governments are what humanity yearns for. Russia freed up into countries many regions that were part of the Soviet. We pray for Tibet to be freed from China. Eritrea was freed from Ethiopia, the Balkans are at peace as many rather than as homogenous. So too we must follow and do away with our hypocrisy. We must no longer stand in the way of Aboriginal and Torres Strait Islander languages, and we must get out of the way of their right to practice their cultures. When we do this we will enrich this vast continent, and steer many more people than ever before to visit and learn from one another. All of us will be enriched, and freed from the burdens of blame. It was not long ago that Yalmay Yunupingu said something to me that needs to resonate with all peoples of this vast continent. It will take a multitude of voices but it can be done if there come together this multitude of voices. To settle for less will not bridge any divides as all the disaggregated data proves. Let many regions of this continent flourish once again with respect for their demography, for their cultures, in the beauty and richness of their languages. To belong to your language is as rich as belonging to your land. There being many identities in this vast continent will not separate or alienate, instead they will bring us together, coalescing us as humanity, and in a humanity born of respect and difference. fantastic article Mr.Georgatos! like Martha Gellhorn before and John Pilger now,you really reach for the humanity that lies in us, and invoke compassion for one of the most oppressed people in the world alongside Native Americans. This article ought to be mandatory reading for all Australia, White and multi-cultural and we much implement the High Court’s ruling of the Mabo case, be dedicated to respecting the Civil Rights of aboriginal people and stop racist legacy practices and give full economic rights to the impoverish people by doing the advocacy of Jon Altman and others which is helping aboriginal people in economic development which is deprived them because of a colonial mindset that is far to much embedded in Federal and local goverments. I think it is about time Australia realised that accepting the status quo is not good enough. Something needs to be done to significantly improve the lives of Indigenous Australians living in remote areas. Something needs to be done to significantly reduce incarceration rates of Indigenous Australians. Something needs to be done to significantly increase the opportunities and options available to all Indigenous Australians. Thank you for those words. I’m sick to death of the experiments in my Aboriginal world. They know nothing of managing Aboriginal lands and people yet tell us what to do and how to do it. Then they say taxpayers have a right to know their dollars are spent correctly. You arrogant sods. We Aboriginal people have a right to every drop of tax payers dollars too that come from our land. We need to rectify that lease Australia has on our land and invoice for its 226 year use and abuse. Gerry and Jennifer, this site is now bookmarked! Perfect for my students. Excellent. Where is the humanity of actors and film companies that make millions off his films.